Plan now calls for completion of Tower 4 by 2013 and "phase-in" of Towers 2 and 3 "over time"
Tower 2 to be built "at least to street level" and rest of tower to be "driven by market demand"
The Port Authority of New York and New Jersey, the City of New York and Silverstein Properties announced Marchg 25, 2010 an agreement on the development of Ground Zero, which has been long mired in controversy and many delays. The joint statement said the agreement was an "outline of a development plan for the east side of the World Trade Center site" and "calls for the immediate restoration" of that side to "at least street level, the completion of Tower 4 by 2013 and the phase-in of Towers 2 and 3 over time." Silverstein Properties is responsible for building Towers 2, 3, and 4 under agreements entered in 2001 and amended in 2006. 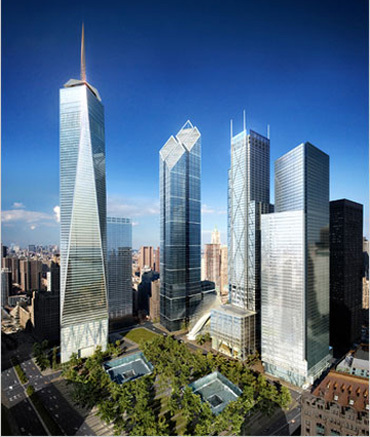 Under the 2006 amendments, the authority assumed responsibility for development One World Trade Center, which was formerly called the Freedom Tower, and Tower 5 in addition to the WTC Transportation Hub, the 9/11 Memorial, the Vehicle Security Center, Greenwich and Fulton Streets, retail development and related infrastructure. About 60 percent of Tower 4 has been pre-leased to the authority and the city and under the agreement the authority will provide a master lease for the project supporting the issuance of Silverstein's Liberty bonds to finance a portion of the tower's construction costs and any payments by the authority under the lease would be reimbursed by Silverstein Properties. The agreement provides for the "immediate construction of the Tower 3 transit and retail podium, with the construction of the office tower to follow so long as Silverstein Properties hits the following private-market triggers: (1) Raises $300 million of private unsupported equity, (2) Pre-leases 400,000 square feet of the office tower, and (3) Obtains private financing for the remaining cost of the tower without a full public backstop." "To help Silverstein Properties obtain this private financing without a full public backstop," the statement continued, "it would receive a capped public backstop of $390 million from the Port Authority, New York State and New York City, together with $210 million of equity from the City and the State of New York, with each public entity's contribution limited to a total of $200 million. Any payments under the backstop would be reimbursed by Silverstein Properties and the public sector entities would also have a future Tower 3 capital events participation. The City's contribution is to be paid for using foregone revenues that will not be collected if the tower does not go forward. Until the public backstop is removed, Silverstein Properties would not be entitled to take profits out of Tower 3." The statement also said that "The Tower 2 site would be built to at least street level under a plan to be jointly developed by the Port Authority and Silverstein Properties. This plan would preserve flexibility for the future development of the office tower driven by market demand." Over the next 120 days, the statement concluded, the parties will negotiate agreements consistent with the development plan and framework and these agreements will then be presented to the Port Authority Board for final approval. An article by Eliot Brown today at observer.com said that the parties had agreed to a $5-a-square-foot hike in the rent the Port Authority would pay for the 600,000 square feet it is leasing in one of Mr. Silverstein's towers. "In all," Mr. Brown wrote, "the deal come as a victory for Mr. Silverstein, who drew a line at two towers, demanding that the Port Authority owed him the responsibility to make it happen on account of the agency's delays. Mr. Silverstein was in a position of great leverage, as without a deal, infrastructure on the rest of the site would have been rendered non-functional without hundreds of millions of dollars in changes, and, if he defaulted, the Port Authority would have stopped receiving rent payments, currently around $80 million a year." The tallest and northernmost of Silverstein's three towers, which has been known as "Tower 2," has been designed by Foster and generally has been the best received. It will be 1,254 feet high and is distinguished by its sloping roof, the only one of the four tower designs now published that has such a feature, which was part of Daniel Libeskind's master plan design. Foster's roof slants sharply downward towards the Ground Zero memorial space. Tower 3, the middle of the three Silverstein towers on the east side of the Ground Zero site, has been designed by Lord Richard Rogers. It is separated from Foster's Tower 2 by Santiago Calatrava's transportation center building, which is dwarfed by the two towers. Tower 3 will be 1,155 feet high and have four spires at its corners rising above the tower's screened roof. The asymmetrical tower will be distinguished by the diagonal bracing on much of its facades and the overall design is somewhat similar, but fussier, than the architect's design for the new New York Times Tower on the east side of Eighth Avenue between 40th and 41st Streets that is being built by Forest City Rattner and is nearing completion now.